Republic Day is celebrated as national festival in India. On 26 January, 1950; the Constitution of India was implemented in the country that is why we celebrate 26 January as Republic day every year. Every Indian feels pride while seeing the National Flag unfurling on Republic Day. 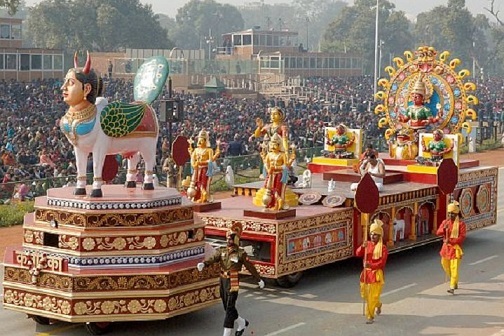 Do you know every year; around 2 Lacs people come to watch the parade of 26th January. In order to ensure proper conduct of the parade, thousands of soldiers and several other people are actively involved in the process. The formal responsibility to organize the parade lies on the Defence Ministry in which it is assisted by different organizations. 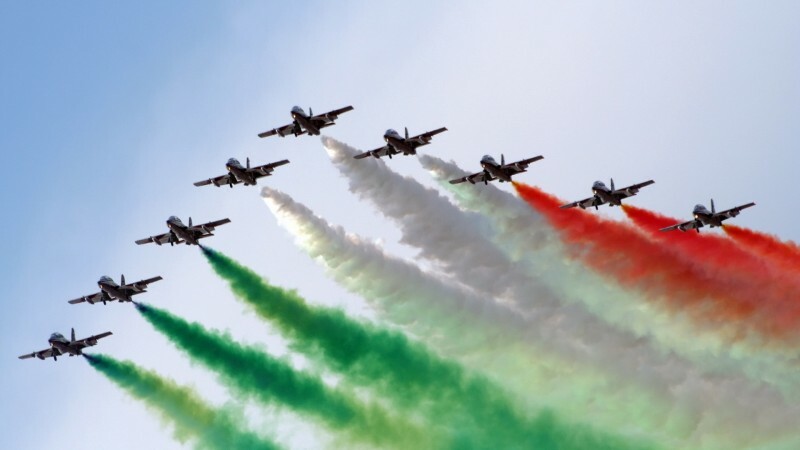 In this article, we are providing 13 interesting facts related to the Republic day parade of 26th January. 1. As we all know that every year, the organization of the parade on 26th January is done on Rajpath situated in New Delhi, but do you know that Rajpath was not the organizing centre for parade from AD 1950 to 1954? During these years, the 26th January parade was held at Irwin Stadium (now National Stadium), Kingsway, Red Fort and Ramleela Maidan respectively. 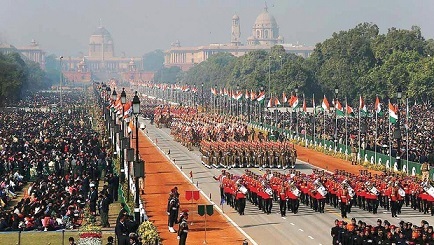 Rajpath became the permanent venue for the parade of 26th January since AD 1955. Rajpath was known by the name ‘Kingsway’ at that time. 2. Every year, the Prime Minister/ President/ or the ruler of any nation is invited as a guest for the 26th January parade. 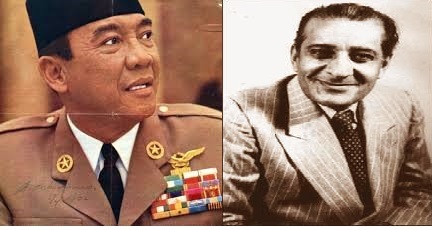 The first parade held on 26th January 1950, President of Indonesia Dr. Sukarno was invited as guest. However, in 1955 when the first parade was held at Rajpath, The Governor- General of Pakistan Malik Ghulam Mohammad was invited. Matamela Cyril Ramaphosa“, the fifth and current President of South Africa will be the Chief Guest on 70th Republic Day of India 2019. 3. The parade event on 26th January begins with the arrival of the President. First of all, the cavalier bodyguards of the President salute the National Flag, and during this time, the National Anthem is played and 21 Guns Salute is also given. But do you know that, firing is not done with 21 canons? Instead, 7- cannons of Indian army, which are known as “25- Ponders” are used for the firing in 3 rounds. The interesting fact is that the time of gun salute firing matches with the time at which the National Anthem is played. First firing occurs at the start of the National Anthem and last firing occurs right after 52 seconds. These cannons were made in 1941 and are involved in all the formal programmes of army. 4. All the participants of the parade get ready by 2 AM and arrive at the Rajpath by 3 AM. But the preparations for the parade begin in the month of July of the previous year, where all the participants are formally informed about their participation. Till August, they practice parade at their related regiment centres and reach Delhi by December. The participants have already practiced for 600 hours before performing on the 26th January formally. 5. 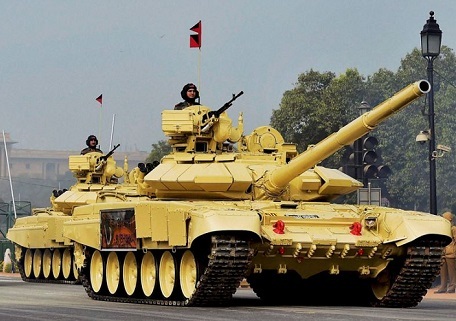 A special camp near the premises of the India Gate is organized for all the Tanks, Armored vehicles and modern equipment showing military power of India. The investigation process for each Cannon and the work of whitewash is performed in 10 stages. 6. For the purpose of rehearsal for the parade of 26th January, each group covers the distance of 12 Kilometres but on the day of 26th January they cover the distance of 9 Kilometres only. Judges are seated all through the way of parade, who judge every participating group on the basis of 200 parameters and based on this judgement, the “best marching group” title is awarded. 7. Every activity performed on 26th January parade event is pre-organized, right from the beginning till the end. Therefore, even the smallest error and delay by the fewest minutes could cost heavily to the organizers. 8. Each army personnel who participate in the event of parade have to pass through 4 levels of investigation. Beside this, their arms are thoroughly checked so as to ensure that their arms are not loaded with live bullets. 9. The tableaus involved in the parade move with the speed of 5 km/hr, so that important people can watch them thoroughly. You will be surprised to know that the drivers of these tableaus drive them through a small window. 10. The most fascinating part of the event is “flypast”. Responsibility for “flypast” lies on the Western Airforce Command, which involves participation of 41 Aircrafts. The Aircrafts involved in the parade take-off from different centres of the Airforce and reach the Rajpath at a fixed time. 11. The song “Abide with me” is played on every Republic Day parade event as it was the favourite song of Mahatma Gandhi. 12. 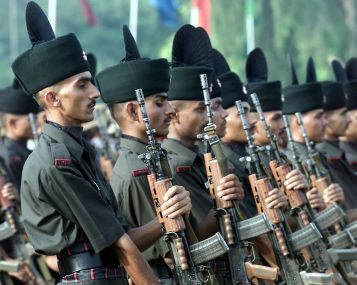 The army personnel participating in the parade march with indigenously made INSAS rifles, whereas personnel of Special Security Forces march with Tavor rifle made in Israel. 13. According to an information obtained through RTI, the expenditure of about 320 crore rupees was incurred in the parade event held in 2014 parade. In 2001, this expenditure was about 145 crores. In this manner, the expenditure made on 26th January parade has increased by 54.51% from 2001 to 2014. Next Story What is depicted by 16 digits printed on Debit Card?